The Chazaq organization has become renowned for its incredible outreach work in changing the lives of hundreds of Jewish public-school students via their afterschool programs for boys and girls of all ages. This past month, they reached a tremendous milestone in transferring their 500th Jewish public-school student to yeshiva in the last 25 months alone. While outreach remains their main focus, Chazaq’s work with the community at large is still going strong throughout the New York area. 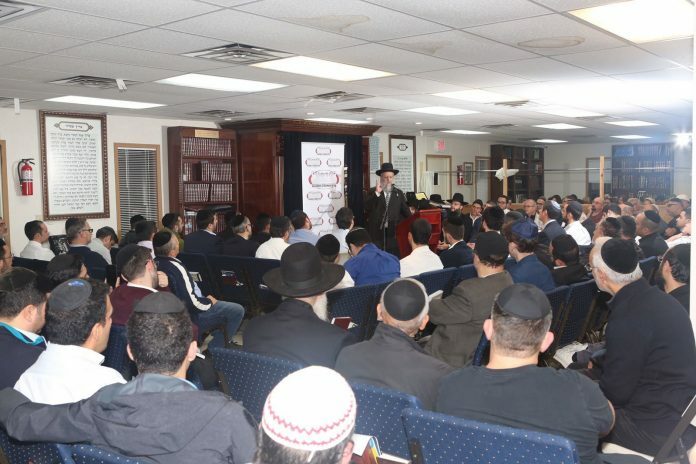 Two notable events in recent weeks included a special shiur from HaRav David Yosef, shlita, at Congregation Shaarei Emunah of the Five Towns, and a shiur by Rabbi Shalom Arush at Congregation Bais Efraim Yitzchok in Woodmere. While both rabbanim hail from the holy city of Yerushalayim, they have followers around the world. Aside from being the son of the late sage Rav Ovadia Yosef, zt’l, Rav David Yosef is also known for his comprehensive works in halachah, having authored over 20 books on the Shulchan Aruch, while Rabbi Arush is known for his writings on emunah and bitachon. Hundreds attended both events and were truly inspired to reach greater heights in many facets of their lives. Both shiurim may be viewed online on TorahAnytime.com. For information about upcoming Chazaq events and programs please visit Chazaq.org. To make a donation in memory or for refuah shleimah of a loved one please email info@chazaq.org.